It is a collection of stories of a barrio girl's mishaps and adventures in the big city... and the places she is fortunate to have explored. It's so easy to stuff our mouths with all the junks in the world. Everywhere we turn, we see restaurants, cafes, food stalls, food shops even 24/7 shops sell fast food. Operative word: fast. Mind you, these are really yummy and cheap, too. I've fallen prey to the convenience of fast food. Some years ago, I had a gallbladder surgery. I'd like to attribute it to a high-cholesterol/high calorie diet courtesy of Mcdonald's. I was there every single day -- only the time changes, lunch or dinner. On weekends, count snacking in between, with a large fries and a large soda. The lifestyle came with a hefty price. My body just shut down. And so for a while, I tried to eat healthy. But healthy is meticulous and expensive. I've seen a pattern of consciously checking on the food I eat and wantonly eating anything that's been deep-fried and just plain unhealthy. Every time though, I imagine my stomach to be like the city's sewerage system. Have you noticed that areas where there are heavy concentration of restaurants/fastfood/cafe have a filmy sidewalk (by the gutter). Oftentimes, the used oil and other cooking residue spill over to the streets. Whenever, I see these, my imagination goes overdrive. I really believe that the environment inside my stomach exhibits the same thing. There are accumulated dirt and fat, trapped inside. There is no way that these are excreted because for one I live a sedentary lifestyle. I only have those occasional workouts. In the grand scheme of things, they don't count. 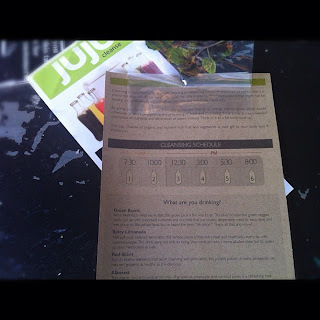 Having heard of a detox or cleansing program called Juju Cleanse, I entertained the idea and placed it on my to-do list. I've always wanted a detox program but it's really pricey. 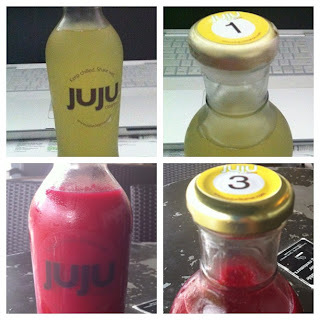 Even Juju Cleanse is quite prohibitive. After reading extensively, I realized that it's worth the price. Read here. Last Saturday, I braved it. In a kit, there are six bottles that are numbered. It has a corresponding time to take each. Also, the kit comes with fresh mint leaves for tea the morning of cleansing. Here's the schedule. The timeline is full. No room for snacking on any solid food. The first four bottles/drinks were a walk in the park. I didn't have a problem at all until my mind keeps on reminding me that I haven't stuffed my mouth with anything other than the drinks. So, the craving starts. Weird because I wasn't really hungry. There's just that feeling or desire that I need to eat. My biggest hurdle was the thought that if these drinks are supposedly for cleansing, these might not taste good. Think: kitchen cleaners. Surprise, surprise the drinks tasted so good I didn't have any problem sipping them. How was my experience, you may ask? Well, apart from the no-food policy, the lightheaded feeling persisted until the last drop. It felt like my head was "floating". There is that sense of being "tired" but then I think that it was just all mind-play. The morning after is a revelation. I woke up much energized, too early than my usual waking hour (on a Sunday, at that). I don't know if I was just excited to eat solid food again. But I didn't really wolf down my sandwich. I took my time. After that one-day cleanse, I made a pact with myself that I will do it on a regular basis. Let's just say that we owe it to our bodies to rid it of toxins. sheng. Travel theme. Powered by Blogger.